Jaime Samms is a new-to-me author, and I felt reading a short story was the best way to see if the author and I were a good fit. I like well-written short stories and novellas, because sometimes I don't feel like wading through 400+ pages for an entire story, and Permanent Ink was a solid choice. Eric is a basketball player from an affluent family. He feels trapped within his parents' ideals, as does his brother the reader meets briefly. His best friend, Angel, has expanded Eric's horizons. After a night of partying, Eric is camped out on Angel's sofa, when Dwayne – Angel's cousin – comes home and hits on Eric. Eric is bi, but it's the outside package of Dwayne that puts Eric off. It's not the color of his skin, or the intriguing tattoos and piercings, it's the ex-con vibe Dwayne gives out. Permanent Ink is an exploration of learning 'don't judge a book by its cover.' Dwayne has an intense story to tell, and it's written on his skin. Eric allows himself to open up and see his new friend as the incredible man that he is. I rated the short story by others in its genre, finding it a quick, steamy romp. While Permanent Ink is a full story, and I thoroughly enjoyed every page of it, I felt if it had been expanded just a bit more, the emotional impact would have been exponentially higher. Dwayne had a big story to tell, but it was told via Eric's narration. Written from Dwayne's point of view, with a bit more length, the story would've been taken in a different direction. I didn't rate the story on what I wanted or wished it had been, but what it was. Permanent Ink was a solid story, wrapped up in a few pages, giving the reader an entertaining read. I look forward to reading more by this author in the future. 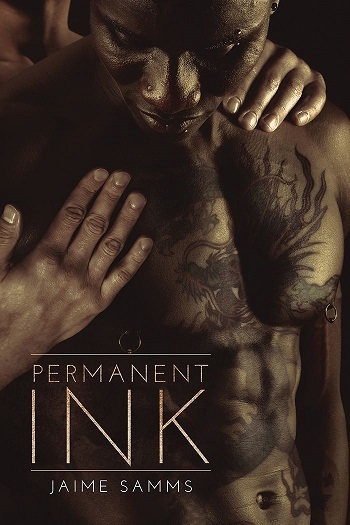 Reviewers on the Wicked Reads Review Team were provided a free copy of Permanent Ink by Jaime Samms to read and review.